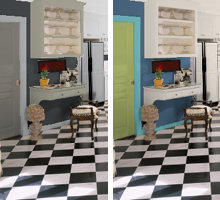 Here you'll find some kitchen color schemes. 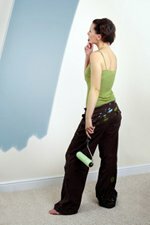 The design of your room influences the 'look' of your colors. 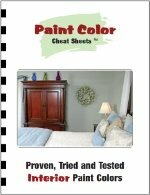 That's why the color schemes on this page are based on actual kitchen pictures, colored with painting software in paint colors that are actually available. 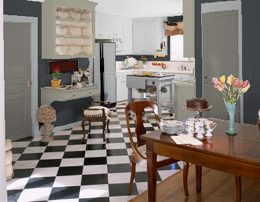 This kitchen has a high contrast floor, and combines modern and vintage elements - let's say "shabby chic", without the shabby. A kitchen like this can have a bolder kitchen color scheme. It has some classical elements, which can work classic but also like a more artistic retro-style. The floor is strong in contrast, but neutral in colors: it's just asking to be completed with a few bolder colors, or a milder tonal range. Off course you can leave it white as well. The floor and furniture make it interesting. White gives a maximum of light. It can seem cold though. Some shaped ornaments can juice up the white - old furniture usually looks good in white. A bold but solid color combination. The black probably looks best in high-gloss. For the high-blood-pressure personality type, the red shouldn't be too orange (better one that's a bit too magenta, than a bit too orange). Click here for more on color and mood. These neutrals give some envelopment. There's not much color, but they give a sedated and natural look. Their shading contrasts to the strong contrastign floor. They contrast to the table as well, because the neutrals go slightly towards blue. Greens, in a somewhat classical or '30s mood. One of the colors is a green earth tone, which is a historical pigment. A bit more arty or modern: strong but quiet colors - toned blues and greens. They contrast with the brown table, making it look warm and interesting. These pics were made with house paint software. 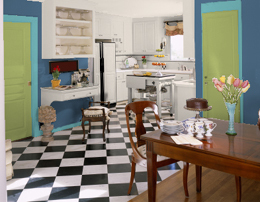 In this program, you can upload a picture of your kitchen, and color it with available paint colors. 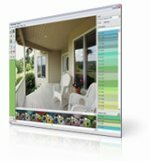 If your're the visual type, and you'd like to carefully plan your painting project, this software might be a good idea. 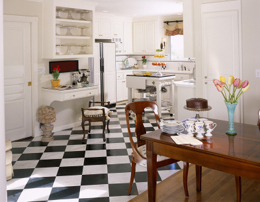 Every kitchen has different styling elements and flooring. 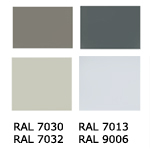 When you make a kitchen color scheme: first define the elements that are already there (and not to be changed), and/or find the stuff that's not available in a thousand different colors - the countertop, specific curtains, furniture, and match your paint color scheme to it. 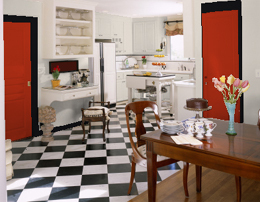 If curtains and textiles are an important factor of your kitchen design, get them first - and pick colors from them. 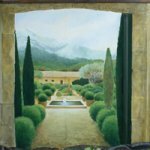 A painting can be inspirational too. 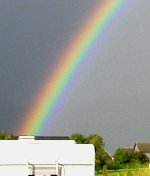 If there's a picture that oozes just the atmosphere you want: pick colors from it. 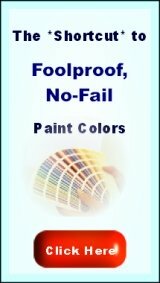 Click here for more on making an interior painting design. 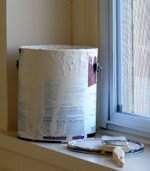 Here you'll find more kitchen painting ideas about other practical considerations: washable paints, how to paint laminate kitchen cabinets, and styling aspects. No matter what style: some colors just look edible (yellow, red) and others don't (blue). Stuff like that has an influences the way you'll feel about your kitchen. If you need warmth and cosiness in your kitchen, you'll choose other paint colors then if you're looking for calm and serenity.